Blowout Sale! Save 65% on the Sewing Scissors 10 inch - Heavy Duty Industrial High Carbon Steel (Right-handed, White) by House Deluxe at Transparent University. MPN: WSY-WSewScissor10-171120. Hurry! Limited time offer. Offer valid only while supplies last. SUPERSCISSORS -by House Deluxe (Right Handed) We are proud to supplythousands of tailors, seamstresses and crafters with superb quality scissors. 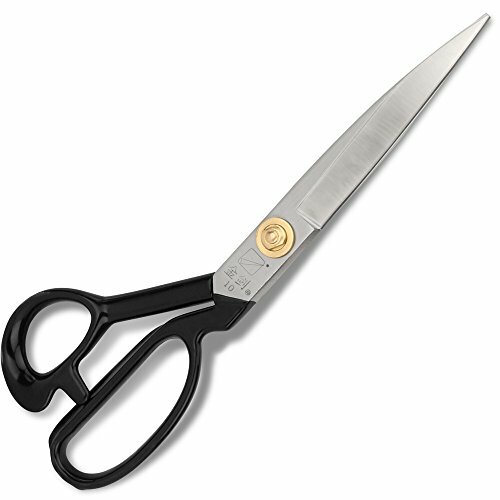 We are proud to supplythousands of tailors, seamstresses and crafters with superb quality scissors. Highquality industrial grade material - High carbon steelmanufactured in Germany that is harder and stronger than the competition'sstandard stainless steel. Ergonomicdesign offers a very comfortable handleand ease of use - Theergonomically designed rubber handle fits very comfortably in your right hand,providing pain free use as well as cutting accuracy. Advancedtechnology - Years of manufacturing experience and technology, combined with oursuperior high grade materials, will provide you with the best high qualityscissors that have a much longer life expectancy while still enhancing yourcomfort and ease of use. Scissorseverywhere - All around all purpose scissors perfect for tailors, seamstresses,sewers, crafters, artists, office use and students. Easily cuts wrapping paper,cardboard, fabrics, leather and embroidery and much more. Strictstandards - Our products are subject to very rigorous selection and testingprocesses to ensure that they meet our high and exact standards in order toprovide you with the very best in quality and excellent value. DESIGN FOR: Perfect for seamstress, tailor, sewer, dressmaker. ALL-PURPOSE & PROFESSIONAL: Best for cutting fabric, denim, leather, paper, clothes and soft materials. High carbon steel that is stronger and harder than stainless steel. ERGONOMIC: The rubberized ergonomic curved handle is not that soft but keep you hold tight and provide hours of comfortable use. Warm reminder: approx. 10.2 x 3.1 x 0.8 inches / 0.62 pounds, quite standard size for tailor's scissors but could also be little big and heavy for some particular users. ♥♥ No Risk Purchase - We are confident that you will love this 10inch sewing scissors, but if you are not satisfied, please DIRECTLY contact us for a full refund or free replacement. Have a try and you will definitely like it. If you have any questions about this product by House Deluxe, contact us by completing and submitting the form below. If you are looking for a specif part number, please include it with your message.